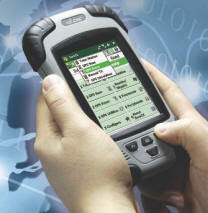 The LT30TM is a touch screen based GNSS/GIS handheld receiver with an internal SBAS enabled high-sensitivity GPS. Designed for efficient field work in the most demanding conditions, LT30TM features a bright, sharp full VGA sunlight readable screen and up to 10-hour battery life. LT30TM is a the ideal rugged field computer for a large range of applications from GIS data collection and maintenance, agriculture field measurement, environmental control using the internal GPS receiver. LT30TM is also a great Field Data Collector for use with Bluetooth surveying instruments. The LT30 is available bundled with Carlson SurvCE, the leading Field Survey solution. Or load ESRI's ArcPad or other Windows Mobile based mapping applications. With an integrated GPRS voice and data modem, LT30 offers internet access to exchange project files with your office. Connecting to external devices like laser rangefinders, RTK heads and data networks is simple with LT30’s Bluetooth and Wi-Fi capability. The LT-30TM enjoys a 2-year factory warranty with US based service.